It was a quiet morning at Griggs Reservoir Park with little wind and an overcast sky that threatened rain making it almost too dark for pictures. The kind of day one pretty much has the whole park to themself. My pessimism about what would be seen, much less photographed, was reflected in my selection of cameras as I contented myself just with a Panasonic FZ200 superzoom accompanied by a pair of binos, my wife expressed her optimism by taking a bird camera. Rain and the resultant higher water levels meant that in many areas Water Willow graced the reservoir shoreline. With the absence of traffic both in the park and on the reservoir, normally wary and prone to flight Great Blue Herons were content to stay on shoreline perches as we walked by. Other birds also seemed less prone to flight as we got close. An immature Male Hooded Merganser is spotted with a group of Mallard Ducks, (Donna). By a rain puddle a Barn Swallow strikes a contemplative pose, (Donna). A Robin with a mouthful of earthworm and mulberry, (Donna). Even with the dullness of the morning the unmistakable fire orange of a noisy Baltimore Oriole caught our eye as it streaked by on it way to a nearby tree. Taking a closer look through dense leaf cover revealed an almost completely hidden nest. Suspended by next winter’s bare branches what remained would be easy to spot. My wife looked ever closer in an effort to see a “new to her” insect or spider. Life that most of us walk right by. White-marked Tussock Moth caterpillar, (Donna). Through the leaves a lone Painted Turtle is spotted. Not a good day to sun oneself on a log. 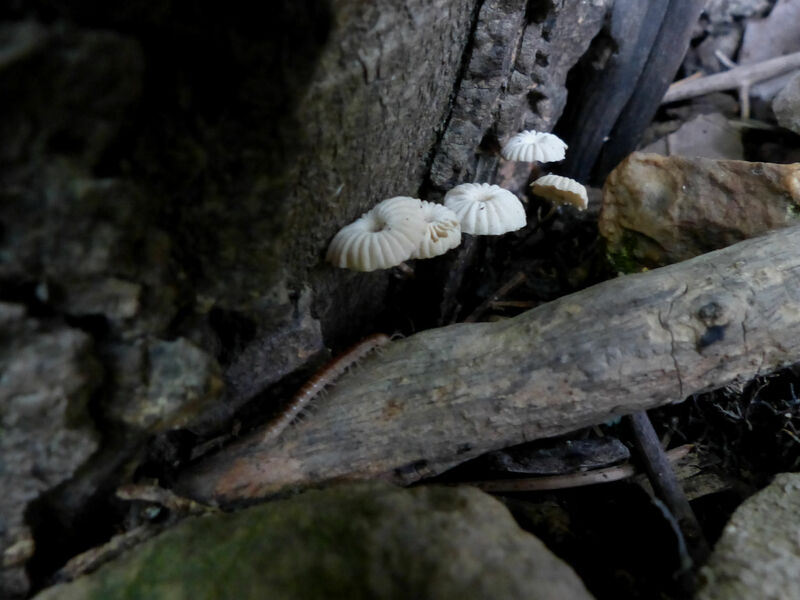 Very small mushrooms caught my eye while a millipede remained unnoticed until a review of the pic. A very small and young Gray Tree Frog tries to remain unnoticed, (Donna). Seemingly unabated, wildflowers continue their march through the year. Those that greeted us just a few weeks ago are gone but new ones have taken their place. On a sunny day they speak in a bright and joyful voice so it seems counterintuitive that the best time to photograph them is usually on overcast days. No blown out highlights, deep shadow values, and more saturated colors. Horse Nettle is a good plant just to look at but not to touch. Canada Thistle is a pesky weed for Ohio farmers. 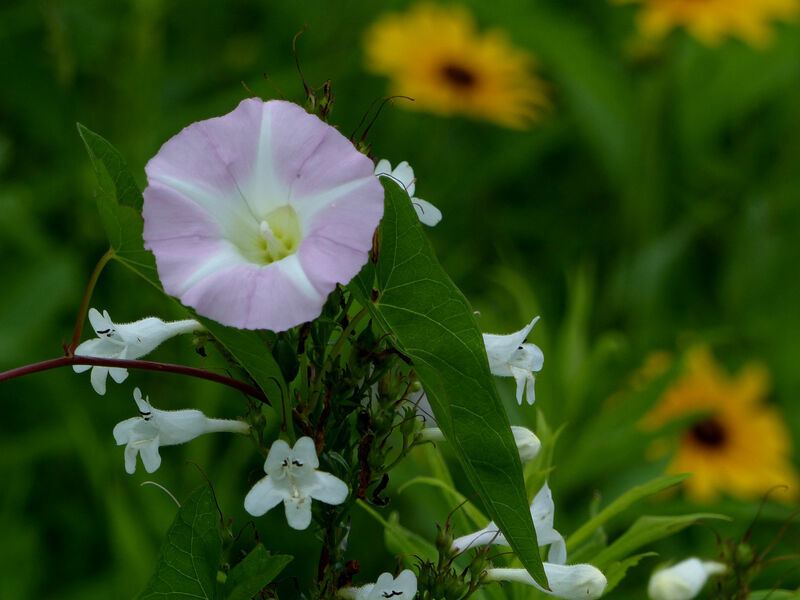 As if playing “King of The Mountain” the vine and flower of the Morning Glory take advantage of an accommodating Moth Mullein. Black-eyed Susan’s spread their cheer. Not the most common of our native wildflower standing forlorn at waters edge is what remined of a fairly large display of Butterfly Weed, someone had picked the rest. It never did rain and as our longer than expected time in the park came to a close so did the time for taking a “closer look” and for reflection. As is often the case when in nature we left much richer than when we came. Perhaps I should stick with photography! I like the water willow and horse nettle, neither of which I’ve ever seen. You got some great photos for a cloudy day! You and Donna did your walk proud. The barn swallow and the tussock moth would have been worth going for alone.